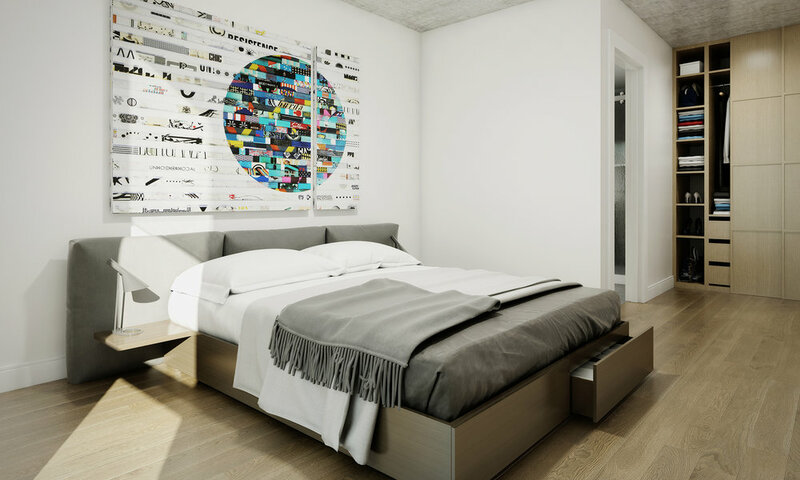 Inspired by the sleek and sophisticated simplicity of contemporary European design, the condos at 989 are Victoria's answer to edgy urban living in the charming downtown core. Using a clean-lined, minimal approach to style, 989 combines top-tier functionality and high-end aesthetics to create modern homes with mass appeal. High-gloss millwork meets the warmth of wooden floors and raw concrete accents in a chic blend of industrial and contemporary elements that are a cut above the rest. Whirlpool Energy Star front load Washer and Dryer. 36” full counter depth Energy Star Stainless Steel Kitchen Aid fridges, in all two bedroom and loft units. Our Jenny Martin interiors have been designed for those who wish to live and work in a downtown urban setting. These are not your Mother’s kitchens. Our induction cook top surface is faster and more energy efficient than other heat surfaces. With no heat emanating from the cook top it is safer and easy to clean, even immediately after cooking. Induction cook tops have the advantage of instant heat and instant simmer, similar to gas cooking, yet are sleek and modern. Open kitchens to be part of the entertainment space. These are suites designed for maximum living. 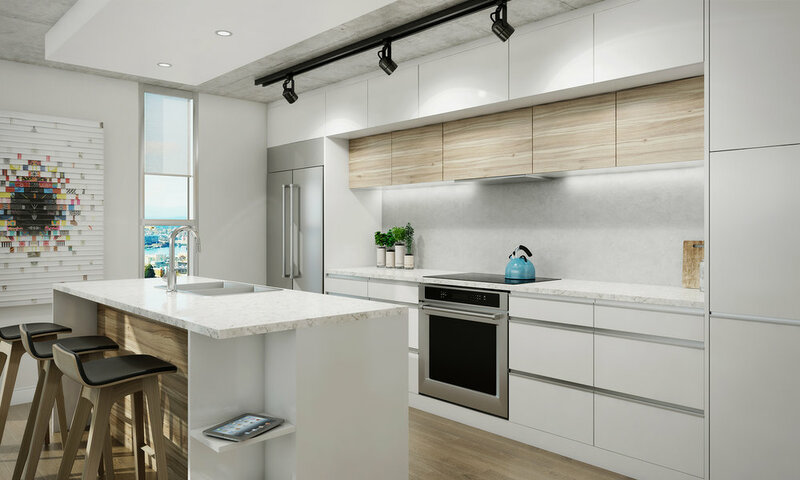 A unique combination of modern, white lacquer cabinets, finished concrete, limited drop ceilings for lighting, and wood accents to create Victoria’s premier downtown urban living space. Our kitchens have pull-out pantries, for the ‘foodies’ among us. We’ve maximized counter space, and almost all homes have Islands for working and preparing food. Every suite has a USB station in the kitchen. All bedrooms will have custom wood built in closets. Slate grey bathroom tiles on both the shower sides and the floor create a striking effect against the floating bathroom cabinets. Underlit lighting further accentuates the modern floating look, while providing extra storage space. Floating Wood Vanity w/integrated pulls and soft under lighting. *Artists works by James Verbicky and Matt Devine not included.